I hope everyone checks out #redthumbreminder! Steve Babcock’s simple, yet innovative solution to text safety is awesome. 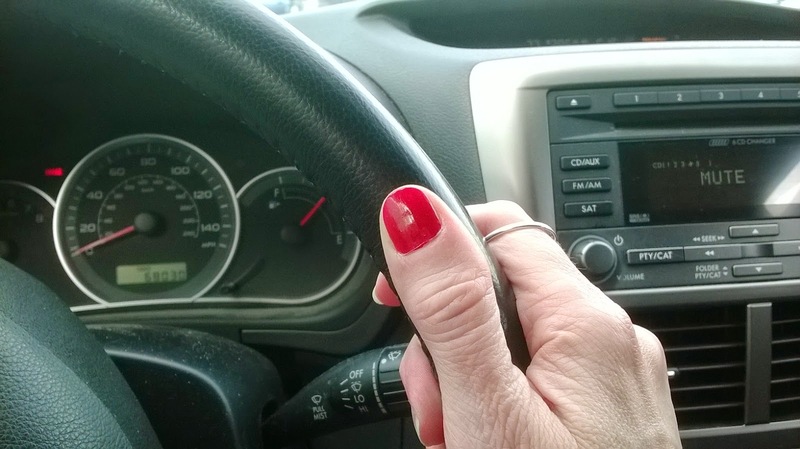 Embraced across the country, men and women are painting one thumbnail red to remind themselves not to text while driving. It worked for Steve, and he was able to break the habit. It can certainly work for us. I hope we stop texting while driving, stop reading texts while driving, and stop handling our phones behind the wheel. Sep 2014. 224 p. Blink, hardcover, $16.99. (9780310729495). High-school senior Sarah McCormick loves poetry, especially when it pours from the lips of her teacher, whom the students call by his last name: Haddings. But any relationship between them is forbidden, at least until Sarah graduates. Still, Sarah writes Haddings a letter, and intends to deliver it to him at school, but on the way, she’s hit by a car, driven by Haddings himself, and is rushed to the hospital for emergency brain surgery. The story, related in present tense, alternates between Sarah Haddings’ viewpoints. Torn apart by remorse, Haddings cannot stay away from the place he is wanted the least: the surgery waiting room. A few plot devices, such as Haddings’ eavesdropping, strains credibility. The story moves swiftly, though, and the battle for control between Sarah and her mother, introduced early in the book, is well portrayed as Sarah fights the battle for her recovery. One of the most interesting and realistic facets of the story centers on the uncertain process of recovering brain function, and the accompanying emotional roller coaster of success and loss. So this is my blog post to set the story straight. I began the novel in 2005, after the real Sarahwas struck in a crosswalk in 2004. Originally a verse novel told in six viewpoints, the novel grew and changed for ten years. In 2009, I fictionalized and added Haddings. In 2014 Hit hit the stores. And now I can sit down and see the scenes play out on screen in Pretty Little Liars. Even to the brother's participation at the climax. I won't say more to avoid spoilers. :) But, are you kidding me? An amazing story. There should really be an after story, about how Sarah McCormick's life trued out. Thanks so much for the encouragement, Teresa Marie!